Archival records function like portraits: taken together, they give us pictures of lives and communities over time. Because records are rare or even unique, we get different views from different archives and archival collections. In this post, we’ll experience a glimpse of how regional differences can be reflected in archival records. In my last post, I showed how two archives across the ocean have a lot in common. The Peel Archives in Ontario, Canada (where I work) and the Cumbria Archive Service in the UK (which I visited) are bound together by both mission and history. They both preserve and make available the recorded evidence and history of human activities in the specific locales they serve. They are both “county” archives. And the requirements of preservation and public access even mean that our institutions have similar layouts and services. Even more important, our records show that emigrants from Cumbria helped to build the County of Peel and the Region of Peel that we know today. In this sense, Cumbria’s people are Peel’s people. Despite the connections between our archives, there are of course some differences that contrast the faces of the old and new worlds. In this post we’ll explore a few of the most outstanding and revealing contrasts: the relative age of our early records, the character of our land records, and unique material we have from one another’s countries. Not surprisingly, the archival records of our regions reflect this reality. Still, however, we archivists found it even more illuminating than we had thought to compare some of the earliest records we hold. 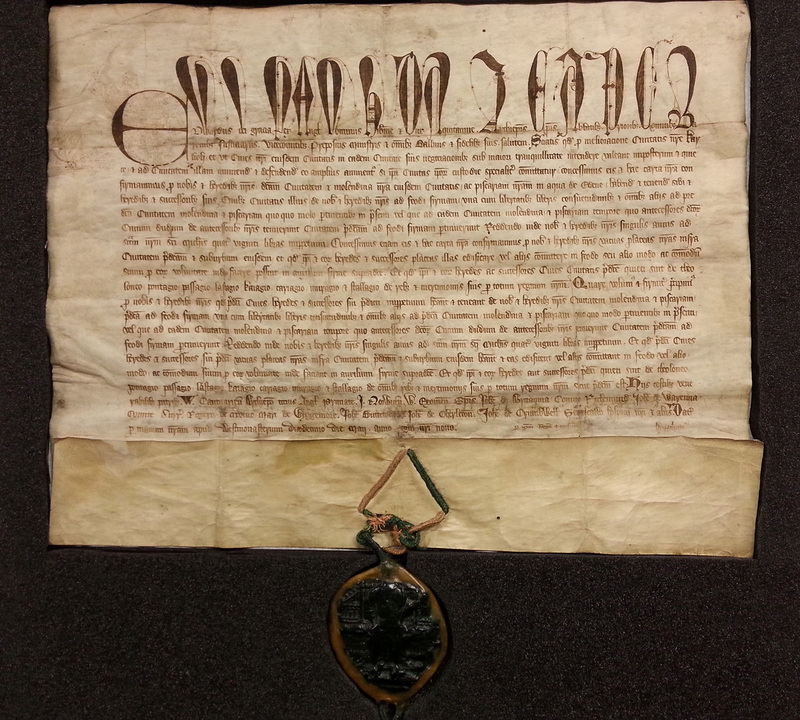 The charter is dated 12th of May and is on vellum with an accompanying green wax seal. Written in Latin, as were the vast majority of legal records in Britain until relatively recently, it outlines various land and commerce rights granted to Carlisle’s inhabitants by their sovereign. Witnesses who signed the document include the likes of the Archbishop of Canterbury, as well as other bishops, earls and other titled personages. One particularly interesting feature of the document is that its initial capital letter is surrounded by an intricate illustration in faint outline. This sketch shows that the document was presumably intended to be decorated with coloured illuminations but that somehow the finishing touches were ultimately neglected. Illuminated capitals like this are called by the wonderful name “historiated initials.” In this case, the story depicted is the unsuccessful siege of the City of Carlisle by the Scots under Robert the Bruce the year before. At the top, you can see an English warrior who is probably Andrew Harclay, 1st Earl of Carlisle, impaling some attackers manning a catapult. Harclay was later horribly executed by Edward II for making a treasonous peace treaty with Robert. As “border” country between Scotland and England, Cumbria’s history is punctuated by skirmishes and conflicts between these peoples, and this document reflects that history in microcosm. One of our earliest Canadian records is also, like Cumbria’s, a legal document between the Crown and one of its subjects in the (then) Province of Upper Canada. A humble schoolmaster, William Johnson Sumner, received this grant on February 4th, 1821 for 100 acres of land in the Township of Chinguacousy, County of York, in the Home District of Upper Canada. 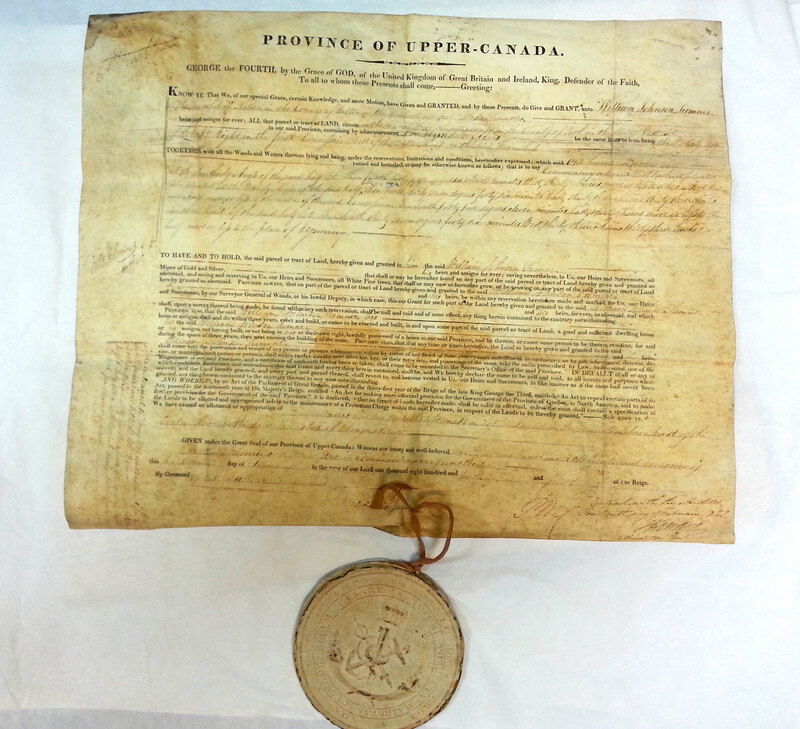 1821 Province of Upper Canada Land Grant from the Crown (George IV) to schoolmaster William Johnson Sumner. The fact that a schoolmaster could procure 100 acres of land was one of the attractions of Canada. 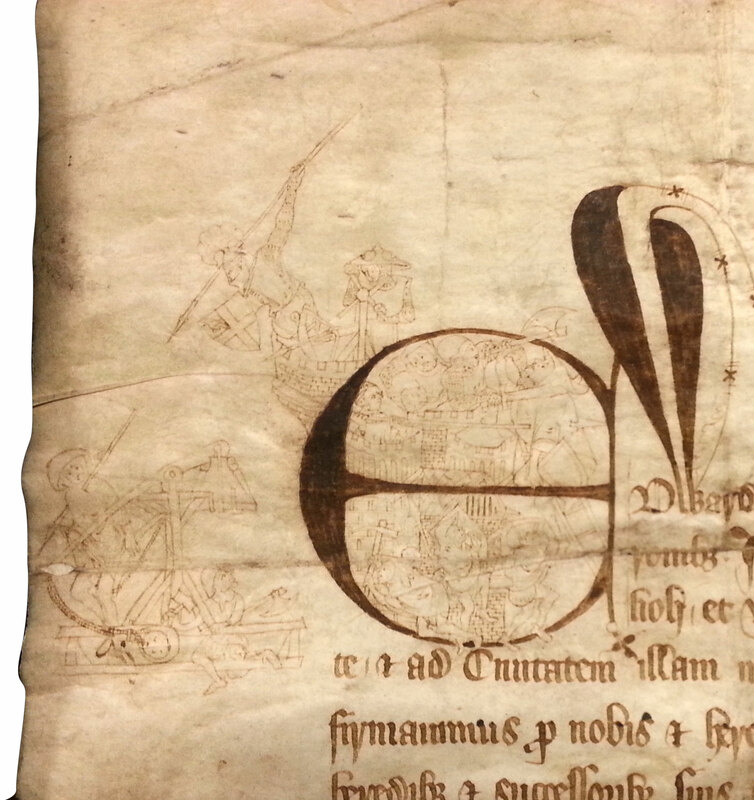 This grant is also on vellum with an attached seal. The string of place names on the grant is packed with significance. It speaks of the meeting of two cultures: the First Nations aboriginal peoples, from whom the name “Chinguacousy” (perhaps “the place where young pines grow”) was borrowed; and the British homeland which bestowed the name “York” on the large region surrounding one of its primary Canadian settlements, the Town of York (now Toronto). Both the Home District and the County of York within it pre-existed the County of Peel and were later superseded. Legal documents – especially those involving political bodies – tend to survive better than highly personal material like private letters. The apparatus of government helps to ensure this. Both agreements in some way relate to land rights. And this brings us to land records. It’s not surprising that land research is one of the most popular reasons for visiting both the Peel Archives and the Cumbria Archive Service: land predates money as a commodity which people have granted, bought, sold, claimed, or stolen. Not only do we literally live off the land – it feeds us and houses us – but it has always been a means of self-identification, a way of defining who we are and how we relate to others. Land records, then, are one of the most revealing archival portraits of communities. I asked Tom to show me one of Cumbria’s most well-used type of land records, and compared this to one of Peel’s. Although both our archives services hold many different types of land records produced for all kind of reasons, even these two samples reveal the uniqueness of our regions. 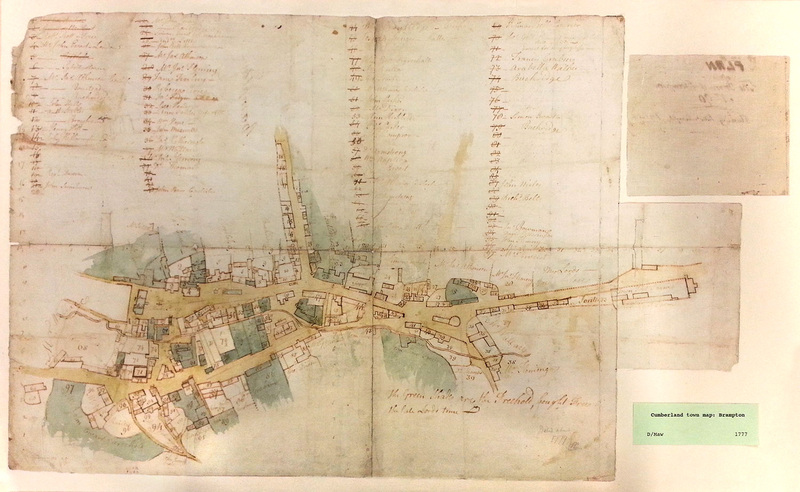 Many Cumbrian land researchers turn to tithe maps like this one of the market town of Brampton in 1777. Tithe maps were used to document the boundaries of land assessed for tithing (a type of taxation). From the early medieval period tithes were paid to the church by means of a tenth of the produce of the land. Tithes were later often transferred to private landowners who took over church land, and they could be paid by cash equivalents. Tithe maps could be relatively informal sketches kept by landlords to keep track of their tenants, or they could be properly surveyed maps; this early one is of the sketch variety. Such maps now function not only as sources of information on land occupancy and agricultural use, but also as rare maps of parishes, villages, and towns. Cumberland Town Map, Brampton, 1777. Cumbria Archive Service. One of Peel’s most used land records also documents land ownership. The Abstract Indexes to Deeds are relics of Ontario’s early land registration system. They constitute summaries of the registered transactions occurring on lots of land beginning with the very first patent issued by the Crown to the first settler on the lot. The lot below is in Toronto Township near the shore of Lake Ontario. The name of “Toronto” was first used in the south of Peel before the present City of Toronto to the east borrowed it. 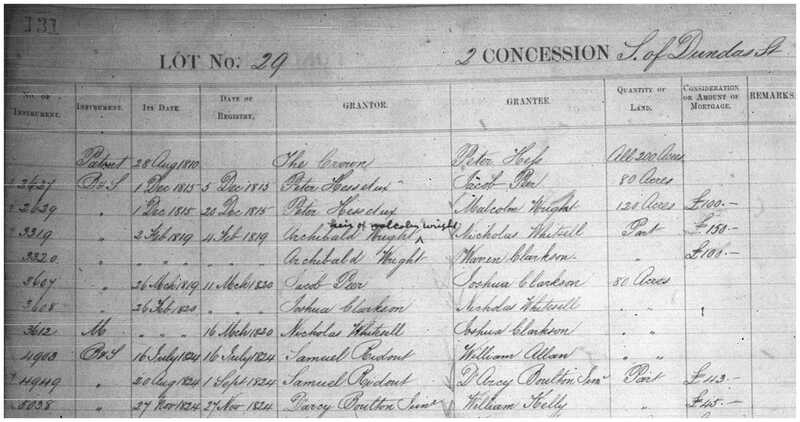 Detail of a page from Toronto Township Abstract Index to Deeds, Book A. The first patent on this 200 acre lot was issued to settler Peter Hess in 1810. Canada’s currency at the time was still the pound. It’s worth noting that Ontario lots are themselves a unique feature of the British appropriation of the New World. Early government surveyors were asked to take a systematic, even regimented, approach to land the Crown regarded as virgin wilderness ripe for population. Before settlement began, land in Peel purchased from the First Nations was surveyed into strips called “concessions,” which were then further divided into 100 to 200 acre lots by strips running the other direction. 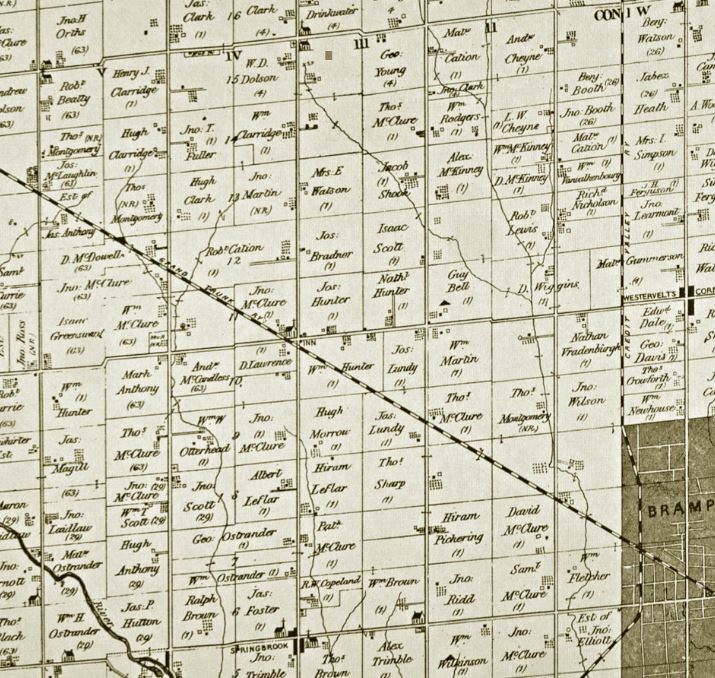 Detail from the 1877 Historical Atlas of Peel County showing lots and concessions in Chinguacousy Township. 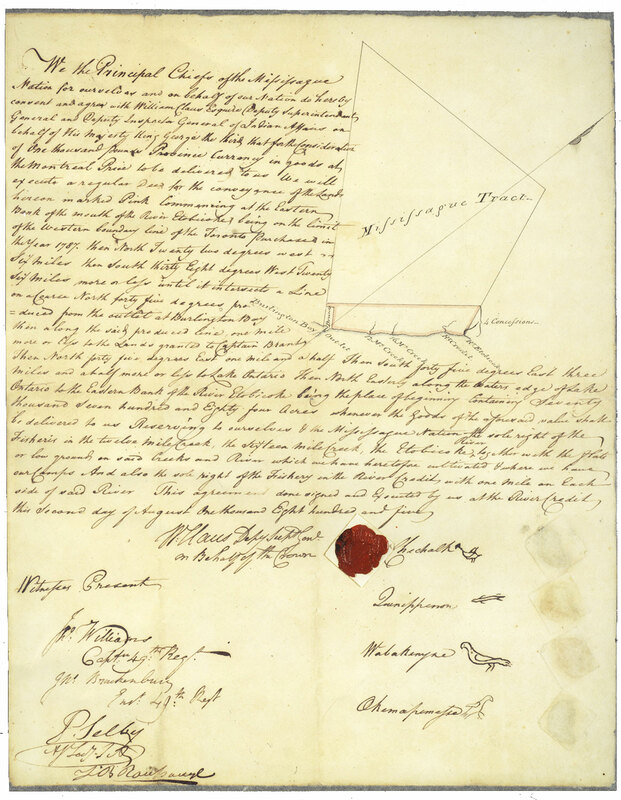 The resulting grid system with two coordinates – the lot and the concession – was the basis on which land was granted and exchanged. It is still the foundation both of modern legal descriptions of land, and of the main road system crisscrossing Peel. In fact the grid lines of the lot and concession system are particularly visible from the air; to fly over Peel at night – as a I did recently on this trip to England – is to see laid out before you in strings of light the two-hundred-year-old stamp of British will power on our part of Canada. Archival records also remind us that the British incursion into the north shore of Lake Ontario encountered a very different view of the land: that of the First Nations people, the Anishinaabe Mississauga people. Settlement of Peel proceeded in stages corresponding to successive purchases of the Mississauga’s lands. By such treaties, the British believed they had legally acquired this land as property in exchange for payment. However, despite their deep ties to the land, the Mississauga people themselves did not view land as a commodity that they could permanently give up; they believed they were granting permission for a small number of settlers to live on and benefit from the land. With the burgeoning numbers of incomers, the First Nations peoples were gradually squeezed onto ever smaller “reserves.” Though the Crown theoretically viewed these areas as belonging to the Mississauga people, it proved reluctant to grant them title deeds. With the intrusion of settlers even into the reserves, the Mississauga peoples eventually abandoned Peel. Role of government in land transactions: Interestingly, registration of land transactions was imposed by the Crown in the Canadas before it was imposed in England. For Britain, Canada was a blank slate on which organized colonies could be built from scratch. Organic vs. planned settlement: The irregular streets of Brampton above hint at the way medieval towns like this grew outwards from an initial ancient settlement in a relatively unplanned way. In contrast, Peel’s geometrically organized lots speak to the top-town attempt at controlling settlement. Of course, within the bounds of the grid system itself Peel settlements grew more organically. Cultural collisions: The history of Cumbria includes waves of violent conflicts and clashes between diverse peoples, all the way from the Romans to the Scots. In contrast, Peel’s most definitive meeting of alien cultures, while on the surface relatively peaceful, involved the supplanting of one culture by another. Above we looked at two ways our differences are reflected in regional archival records. It’s all the more interesting then, to realize that Cumbria has Canadian records, and Peel has English records. It’s important to understand why local history archives might keep records seemingly so unrelated to the areas they serve: archives reveal the way people related to one another by sharing records. For example, letters sent from one county to another may wind up in an archive in the country of the receiver, not the sender. To read more about Peel’s international records (and about our two oldest English records), check out our post A Trip Around the World in Archival Records. The reasons English people had Canadian records, and Canadians had English records tell us something about those people. This is why archival research takes researchers all over the world in their quest to make sense of their own home. In our next post we’ll look closely at records that reveal specifically Peel and Cumbrian people to one another. For now, here is a fascinating glimpse of records we hold from one another’s countries. Canadians may be surprised to learn that the Cumbria Archive Service has letters from one of its longest-serving and influential prime ministers, William Lyon Mackenzie King. They were written to diplomat Sir Esme Howard who was also heir to a title in Cumbria. The Library and Archives Canada photograph on the right shows King and Howard together in Washington DC. 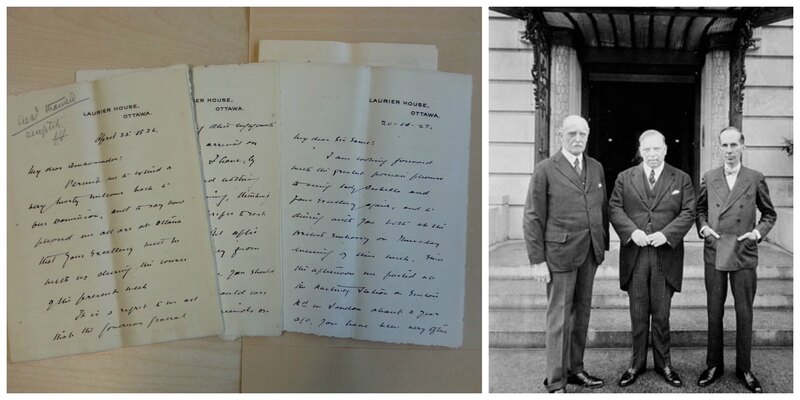 Letters: Sir Esme Howard fonds, DHW/5/29, Cumbria Archive Service. Photo: Library and Archives Canada, William Lyon Mackenzie King fonds, MIKAN # 3232835. 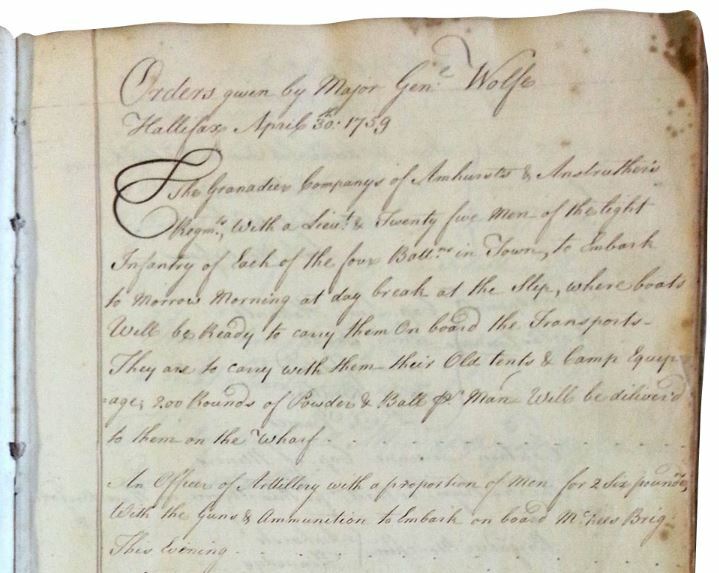 Another Cumbrian Archive Service record of great interest to Canadians: a military order book of the Anglo-Canadian hero General Wolfe. from 1759. It was found in the family papers of the Ballantine Dykes family of Dovenby Hall. Cumbria Archive Service, DBD/10/3. Many of the English records in the Peel Archives fall into two groups: legal documents, and personal letters to English emigrants. Above are details from two such documents. Left, a 1720 manorial court document from Hedingham Essex. Right, an 1858 letter to an immigrant to Canada from Thixendale, Yorkshire. With grateful thanks to the Cumbria Archive Service for allowing me to photograph and post images of some of their records.